​It also covers the changes in assessment introduced as from Course 13.
a number of students (past and present) who used a blog to share how they were tackling individual assignments, what they produced and the feedback they got. There's much to learn from the different blogs posts - not least how much students improve over the course of the Diploma! READ the assignment carefully - if you read all the blog posts you will lose count of the number of times students will say they wish they had read the assignment more carefully at the beginning. Assignments are like any other assessment - you get marked on the assignment you were set - not on the one you wanted to do instead! Think about seasons - these affect the availability of plant and flower specimens and how long they will keep. The blog posts highlight how students tackled this aspect of each assignment - and how they plam ahead. Numbering: Numbering of assignments has changed i.e. Assignment 6 is now part of Assigment 12. In 2017-18 (Course 14) the numbering of assigments after 7 changed after the introduction of the new assignment on Botany. Artists whose work is included on this page are listed inbetween Assignments 6 and 7. You can also see which artists were awarded a Distinction at the final assessment. Suggest a Blog or Blog Post: Use the comment form to suggest a relevant blog post which deserves to be included. Other forms of Support: Some years create their own Facebook Year Group for discussion of their assignments. Others join the now very large Botanical Artists Facebook Group which includes many graduates and current students of the SBA Diploma Course amongst its 5,000+ members. Line drawing in pencil or ink. Single flower study with one leaf in pencil or ink, outlined and stippled. Both subjects of your choice. Complete study in pencil showing tone and texture. Subject of your choice. Suggested exercises. 'Rosa', the line drawing, I was told was drawn well, but the line was a bit too dark for painting purposes. The brief was to draw it as you would before painting, but make sure the tutor can see it! Obviously I didn't get the balance right! Three exercises covering shading, layering and blending. Using the knowledge gained produce a small study of flowers and foliage, not smaller than A4, using continuous tone. Also one flower, one leaf and a small piece of fruit such as a plum, apricot, cherry or a few grapes. Make a green colour chart using blues and yellow and also proprietary greens mixed with other colours. The main assignment requires you to paint a page of assorted leaves, minimum number eight. Variations and suggestions for this will be given in the individual assignment information. Students may wish to choose the option of completing this assignment on vellum. Janene Walky - Leaves of Pacific Northwest Natives, SBA Assignment 3 - Mahonia repens (Low Oregon Grape), Sedum oreganum (Oregon Stonecrop), Penstemon serrulatus (Cascade Penstemon), Maianthemum dilatatum (False Lily of the Valley), Vaccinium ovatum (Evergreen Huckleberry), Tolmiea menziesii (Piggy-back Plant), Veratrum californicum (California Corn Lily), and Oxalis oregana (Oregon Oxalis). Exercises: wet on wet, wet on dry, etc. The differences resulting from mixing and layering paint. Paint a page comprising seven flowers heads with no more than 6cm of stem, using examples of different shapes and colours. A portrait of one variety of flower. This may be in gouache or pure watercolour. I like to draw onto either tracing paper or cartridge paper, and then create an ink version of each individual component on separate sheets of tracing paper (shown in the photograph below). This makes composition planning much easier, and it means I forever have an ink copy of each drawing individually. A portrait of fruit with or without dissection. One or more varieties. Texture will play an important part in this assignment. I used to think of plants as being quite inert and stationary, but as I have studied specimens closely over time while doing my drawings, I realize that they are constantly in motion. The leaves and flowers continually make small adjustments according to the light and moisture in the environment, and as they develop and fade. At first I was confused and wondered how I could continually get my drawing so wrong, but it slowly dawned on me that the plant was moving so I needed to choose a spot for a given leaf and leave it there in the drawing even if the plant had moved on to a new position! The Botany assignment is to improve your understanding and observations of the subject. Three botanical studies are set as follows: the parts of a flower and how they are put together; a comparison of two leaves; interpreting the structure of a fruit. Understanding the Flower Plants by Anne Bebbington is provided as useful guidance for this assignment. Texture will play an important part in this subject. Shevaun Doherty - Vegetables in an Arab Spring (Purple carrots Daucus carota) . Plus one of my blog posts Botanical Art under fire (2011) - it demonstrates that SBA Diploma students keep going and get their assignments in on time whatever the problems! This will require a true example of botanical illustration where art and science meet and should include dissection, root or bulb as appropriate. This may be submitted for assessment incomplete if berries or other fruit, or autumn foliage are to be added later in the year. Produce a sketchbook page (NOT a page in your sketchbook), of line and wash studies of plants from an environment of your choice, eg marshland, waste ground, meadow or moorland. It is a lot harder working outside rather than in the studio. Especially if you live in an area with an infinite number of blood thirsty insects. So for this project I have visited my study area frequently though I often pick a few flowers and bring them home to draw. This of course would not work if I was studying a rare or protected species of plant. However I am fortunate that everything I am including in this next painting grows in abundance and can be found near many roadside clearings. Laura Ashton - 'My Sketchbook Progress' for the Working in the Field assignment. She lives in Canada. Lore Vreeke - Working in the Field at Wildwood park, a regional park in Thousand Oaks, California. This post has some wonderful images of working papers and sketchbook pages. Claire Ward - Cors Caron plants from a bog in Wales - bog bean (Menyanthes trifoliata), bog rosemary (Andromeda polifolia) with a dissected flower and insect eating sundews (Drosera rotundifolia). This became Assignment 11 in 2017. A piece of work showing how photographic reference has been of assistance to you. This may take the form of a design using out-of-season subject matter. I didn’t realise until working on this piece how important it is to take good photographs, and how many tricks there are to make your life so much easier when it comes to using them as your reference. Jarnie Godwin - A photo finish, Off the Starting Blocks!, Pretty in Pink, (and brown, and green), An Inconvenient Truth, (and painting upside down), Sammy and Lucy Hit the Road! and Sammy Snail Gets a New Friend! This becomes Assignment 12 in 2017. Use a mix of flowers, foliage and berries to create an important, traditional study. This piece prepares you for your final Diploma work portfolio which will be adjudicated by a panel of specialised assessors. I'm struck by how much work each student has put in to this course in the last 27 months. There are no holidays, work on assignments must continue regardless of the calendar. Whether it's Christmas, or the long summer school holidays, the assignments must be done. ​See next section below for how ASSESSMENT has changed as a result. Part 1: a true botanical illustration with dissections etc, for which Assignment 8 provided the trial run. Part 2: a mixed study for which Assignment 11 will have provided the trial run. Part 3: a study of fruit or vegetables on the lines of Assignments 6 and 7. Part 4: an essay of not more than 2,500 words This must be researched and written during the course within prescribed subjects, with a minimum of three images, and submitted as part of the Diploma Portfolio. Appropriate allowance will be made for students whose first language is not English as judgement will be made on content and understanding rather than grammar. Part 5: one sketchbook (provided with the Course Materials). This should be submitted with the Diploma Portfolio which will be judged according to the use and value the student has placed on it over the duration of the Course, ie for planning compositions, quick sketches and studies when deciding on a subject, making quick tonal studies, colour charts and colour mixing in order to get the correct shade for chosen subjects, noting colour changes and flowers maturing, etc. Only the sketchbook will be judged: loose sheets or photographs will be disregarded. ​Part 1: a true botanical illustration with dissections etc, for which Assignment 9 provided the trial run. Part 2: a mixed study, for which Assignment 12 will have provided the trial run. Part 3: a study of fruit or vegetables on the lines of Assignments 6 and 8. Part 4: during the course, an essay of not more than 2,500 words must be researched and written within prescribed subjects, with a minimum of three images, and submitted as part of the Diploma Portfolio. Appropriate allowance will be made for students whose first language is not English as judgement will be made on content and understanding rather than grammar. The sketchbook has been dropped from the final portfolio. Note that planning for and sometimes the execution of Diploma work does not always start after the assignments. JR Shepherd - Progress on my last piece for the SBA + I passed with a credit! The Changes were introduced as from Course 13 when a new assignment for Botany was introduced. The weighting of assessment and the grading of the Diploma also moved from being entirely focused on the final diploma to continuous assessment throughout the Course. Marks given for assignments will NOT contribute to the Course total. The Course grade will be based solely on three Diploma Portfolio pieces, the sketchbook and an essay. This meant that none of the assessments completed prior to that date counted towards the final grade. Part 4: an essay of not more than 2,500 words (10%). Assessment changed with effect from 2016. ​Each assignment has 10 marks that count towards the total marks for the Diploma. Vicki Lee Johnston graduated from the SBA Diploma Course with Distinction in April 2013. Links in the name are to the artist's website. The name of the blog is indicated in italics. Vicki Lee Johnston DipSBA(Dist.) (Vicki Lee Johnston - Botanical Art) - Lives in Western Australia - and of course all the seasons are out of synch with the course! Vicki graduated from the Diploma Course with Distinction. Laura Ashton DipSBA BAC (Laura Ashton Illustration and Design) - Lives in Canada; originally from Victoria B.C., now living in North Okanagan. In 2014, Laura Ashton was awarded a Diploma with credit and the Jantien Burggraaff Memorial Award for progress. In 2015 she became a member of the Botanical Artists of Canada. Helen Cousins (Petals and Paints) Started January 2014. Graduated in 2016 with Distinction. 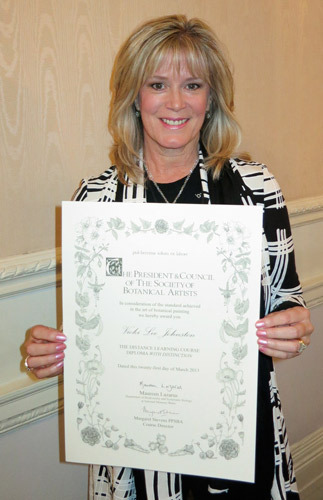 She got the 'Award for Excellence' for the highest mark achieved in the Society of Botanical Artists Distance Learning Diploma Portfolio. She was also studying Medicine at Southampton University at the time!. Helen's posts are excellent in providing feedback on how her assignments were marked thus providing lots of information for those currently studying or thinking about doing the Diploma course. Jessica R Shepherd DipSBA (Inky Leaves) - Lived in London and now lives in Spain. (DLDC7) Trained in Botany first. Dianne Sutherland SBA (Dianne Sutherland - botanical artist) - Dianne was awarded a Distinction in 2011; she's one of the Moderators of the Facebook Group and has been an artist and illustrator for 30+ years. She's also a tutor with clients all over the world. Claire Ward DipSBA(Dist.) (Drawn to Paint Nature) - Lives in Ceredigion in West Wales. In 2007, Claire was awarded a Distinction for her Diploma and also won the award for most improved student. Julie Whelan SBA DipSBA (Julie's Botanical Blog) - Lives in Enfield, Middlesex (DLDC7) Graduated in 2012 with credit. As I have moved through the course, I become increasingly aware of the collaborative aspect of each painting or sketch I do. It is a matter of finding the right plants at the right time, finding quality specimens, and having the needed materials to convey their beauty. And without the beauty of nature, there would be nothing to paint. Tell me about your blog post!